Iconic Canadian Flavor Inspires New Variant, Combining the Legendary Taste of Crown Royal with a Touch of Natural Maple Flavor. Crown Royal added another branch to the family tree with the announcement of the brand’s first foray into the rapidly growing flavored whisky category – Crown Royal Maple Finished. Inspired by the heritage and authenticity of the maple tree, Crown Royal Maple Finished begins with the legendary taste of Crown Royal whisky. The liquid then incorporates a touch of natural maple flavor achieved through a proprietary maple toasted oak finishing process for added smoothness. A unique offering to the expanding whisky category , Crown Royal Maple Finished is made with the perfect balance of whisky and natural maple flavors to create a high quality product for Crown Royal’s consumers. The maple extension is a great fit for those who love the classic taste of Crown Royal DeLuxe, but are seeking interesting new options. As consumers across the country discover this exciting flavored whisky, Crown Royal reminds all adults to please enjoy responsibly. The new installment is finished by running the whisky through maple toasted oak, resulting in an exceptionally smooth tasting experience that carries a genuine light maple-sweet flavor, followed by a warm, woody caramelized note on the end. Rich colors of amber and topaz blend to create a full-bodied appearance. The 80 proof (40% ABV) whisky’s aroma incorporates the elegant bouquet of light, fresh maple combined with Crown Royal’s signature caramel and vanilla nose. To fully experience the liquid’s versatile flavor, Crown Royal Maple Finished can be enjoyed as a shot, on the rocks or as the key ingredient in a number of cocktails. Crown Royal Maple Finished will be sold at a suggested retail price of $24.99 for a 750 ml bottle and is currently available nationwide. Crown Royal Maple Finished’s regal packaging is a slight variation on the classic Crown Royal style, incorporating warm colors of copper and auburn into the label, which displays the traditional image of the maple leaf in the background. The iconic bag that accompanies the bottle flaunts a deep brown color with gold embroidery accents. 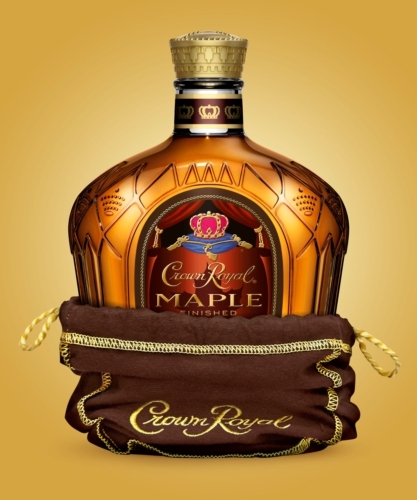 The launch of Crown Royal Maple Finished will be supported through a full marketing mix, including television, print and online advertising, as well as public relations, strong digital extensions and point of sale materials. Diageo (Dee-AH-Gee-O) is the world’s leading premium drinks business with an outstanding collection of beverage alcohol brands across spirits, beer and wine. These brands include Johnnie Walker, Crown Royal, JεB, Windsor, Buchanan’s and Bushmills whiskies, Smirnoff, Ciroc and Ketel One vodkas, Baileys, Captain Morgan, Jose Cuervo, Tanqueray, Guinness, Beaulieu Vineyard and Sterling Vineyards Wines.